The Clubman has long been the odd man out in Mini's lineup. It was an oddball in its previous iteration, and in its current form, is made somewhat superfluous by the advent of the four- (or five-) door hardtop hatchback. But the Anglo-Saxon marque is keeping at it, rolling out a facelifted version today. The refreshed sheetmetal is the main difference between the "new” Mini Clubman and the existing one introduced in 2015. But while it was at it, the BMW division has also updated the retro wagon with new equipment and technology. Aesthetically, the refreshed Clubman benefits from a revised front-end design with new matrix highbeams, LED headlights and LED fog lamps. The taillights are also LED units, with an optional Union Jack design. The selection of wheels are new as well, of course, and come optionally mounted to a new sport suspension that lowers the ride height by 10 millimeters (or about 0.4 inches). There are new paint colors available, combinable with a white, black, or silver roof, and an available Piano Black Exterior trim package, along with a range of new interior treatments and an extensive range of options. Inside the Mini Connected infotainment system has been updated, with a 6.5-inch (or available 8.8-inch) touchscreen, and either a physical controller or a touchpad. Wireless charging is available for your phone as well, bundled (along with navigation) with the larger screen and touchpad. 4G internet comes standard, and the system works with Apple CarPlay (but not Android Auto). What hasn't changed is the Clubman's essential layout, with two full doors on each side, a vertical split tailgate (with two more doors), and an extended body that gives it between 360 and 1,250 liters (12.7-44 cubic feet) of cargo space. 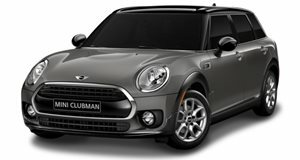 On a global basis, the updated Clubman will be available with six engine options, but we'll likely continue to get just two in the United States: the Cooper and Cooper S, both available with either front- or all-wheel drive and with a six-speed manual or seven-speed dual-clutch transmission. Output remains the same, the Cooper's 1.5-liter turbocharged three-cylinder engine kicking out 134 horsepower and 162 lb-ft of torque, and the 2.0-liter turbo four in the Cooper S producing 189 hp and 207 lb-ft. A new John Cooper Works performance model is slated to follow "at a later stage,” which we hope will be soon.